"Uh... gimme a second... you're... uh, Cavailier? Cornelius Stirk? Film Freak? Gimme a clue, here, I---oooooh.."
The issue starts where the first page of the first issue of this series started... at "the end". 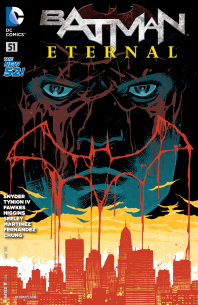 Batman is unmasked, chained to a signal light, his body bloodied, a bat symbol carved on his chest, and an enemy who knows his identity mocking him, bragging, telling him that he's taken everything from him. And why not? Cluemaster's gone through a lot of trouble here. Drugging Gordon with mind altering substances to set off the chain of events at the subway. The invitation to criminals like Hush and Falcone with an axe to grind. Giving Batman bigger targets to fight as cover. It's been well thought-out. And now, after Batman has repleted his resources, his allies distracted and scattered, and himself disabled and at his mercy. But, naturally, the villain makes the mistake of monologueing, and even though it doesn't seem to make a difference at first, somebody else steps in and grabs Cluemaster's prize. "I AM A FIRST-RATE KNOCK-OFF!" 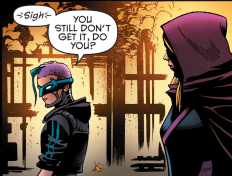 This leaves a very important question that I can imagine will be answered in the final issue, but Im going to speculate here about, regardless: How involved was Lincoln March, the Owlman, in the events that have transpired? Was he there from the beginning? 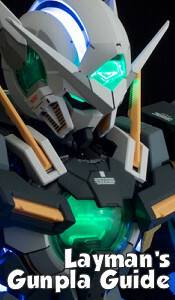 Is he just hijacking Cluemaster's plans, or has he been manipulating things all along and using Cluemaster to make a point? Because I have to believe that this concentrated attack on all that Batman is, is more than Hush. Hush referred to "a family friend" that helped him escape custody in the Cave. Riddler was hiding out in a cold climate, the kind that might hinder a Talon of the Court of Owls. 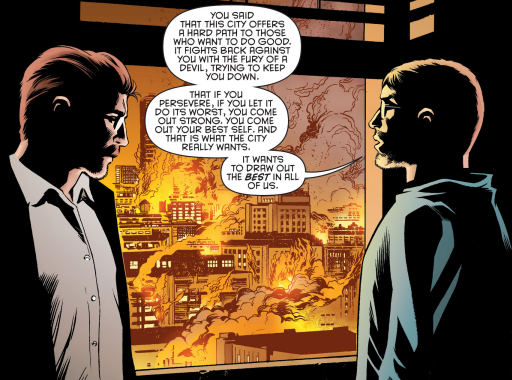 We already knew that, according to Stephanie Brown, Cluemaster was meeting with "Bruce Wayne", and that the only villain that could pass for Bruce Wayne in this continuity is Lincoln March, but there was more than just that all along, a sense of bitterness from somebody who had been forgotten. "Just give me a second, I have to make sure there aren't any villains behind me." This whole mess, this entire scheme, it was originally so that Cluemaster could prove pull off a grand scheme that Batman would be too distracted to see through. But it was more than that for March. He used Cluemaster and his group to show Bruce what happens when you forget. Because Lincoln March believes that he's Thomas and Martha Waynes' youngest son, a child who was born prematurely after the Waynes were in a car accident, and grew up sickly in Willowwood Orphanage, where the Court of Owls found him. 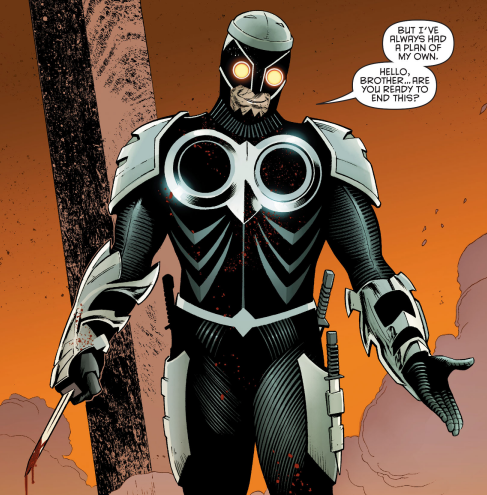 He took part in their plans to seize control of the city, faked his own death and with the regenerative fluid (the same fluid that Joker's "immortality" might be derived from), and became the Owlman we see now. Cluemaster's throat is cut right after mentioning the Waynes being murdered by a nobody, just as easily as he planned to kill Bruce. Since Lincoln believes himself the son of the Waynes, he wasn't just going to stand by and hear about that. And now Lincoln can reveal his lesson to his "brother". With Bruce worn down to a nub, his punches lacking power, bloodied, and beaten, how is the Dark Knight going to rise again? We'll just have to see how this ends! Light Yagami would be ashamed of you, sir. Oh, and hahaha, of course Stephanie Brown flakes out. But she'll probably return, so don't hemorrhage, Spoiler fans. "But it should taste like apples, Harper! I mean, apple is in the name!" That's a great nod to Bruce's speech in Zero Year.